Door Prize Winners have been chosen from the attendees of Carolina Farm Credit's 2015 customer appreciation events. 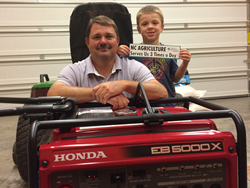 Greg Barbee and his son Sam with their new generator won from Carolina Farm Credit. Vance C. Dalton, Jr., CEO of Carolina Farm Credit announces that Arthur Duncan and Greg Barbee are the winners of the 5,000 watt Honda Generators given away as association-wide door prizes at the spring customer appreciation events. Duncan is a customer of the Taylorsville branch and Barbee is a customer in Concord. During the month of April, each of Carolina Farm Credit’s 36 branches held customer appreciation events, and over 2,000 customers attended. Carolina Farm Credit gave over $5.5 million in patronage refunds back to its member borrowers in the form of cash payments.